Emporio Armani for Her is the magic flavor more and more fascinated you. Emporio Armani for Her 100ml. EDP created Emporio Armani in 1999. Oriental-floral aroma, ideal for the evening. Emporio She is a blend of jasmine, heliotrope fruit, with touches of vanilla and musk. Golden metal bottle hides a different species, in perfect harmony. It is the result of the following top fragrance Notes: cardamom, mandarin and heliotrope. The middle notes are: vanilla, sandalwood and oakmoss and the base of the fragrance is: vanilla, cedar and musk. Emporio Armani is recommended for daytime use. It is is an exotic fragrance exclusively for women. Do you desire to celebrate femininity? Mystical and exotic ingredients give this fragrance a touch of exoticism and uniqueness. Sweet essence of vanilla and cedar combined with flowers and light spices makes you think of distant lands. Femininity is reflected in the combination sensual and discreet Emporio Her. Giorgio Armani brand is known for quality perfume with unique flavors. 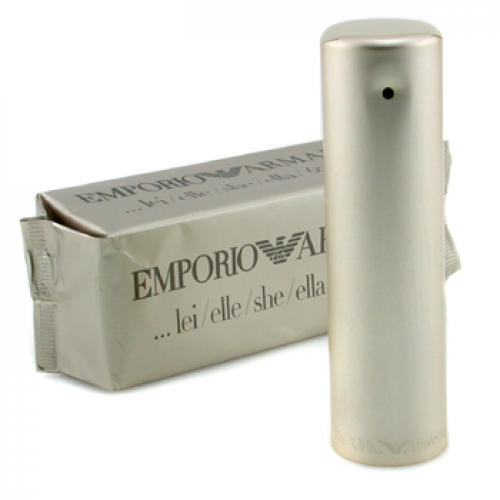 Emporio Armani Perfume Her was released in 1998 and was rated as a perfume simply unique attractive design of the bottle. Exotic Aroma fragrance Emporio Her enjoys great popularity is like a celebration of sensuality, femininity, a unique flavor. a new style of oriental flavor, spicy cardamom through with a delicate note of tea. Thin, though not rich, he reminds heartbeat light note of heliotrope and gives the skin a similar sensibility, enhanced thin woody trail of cedar and musk imperceptible warmth.